This has to be the easiest Jam recipe ever. We have looked in supermarkets for a low carb Jam and just couldnt find one. At present here in the southern hemisphere Strawberries are in season, hence cheap. Like alot of low carb food ideas, fresh and simple is best. You can make this in any quantity you like, 2 regular punnets will make about 300-400grams of this delicious Jam. Mash or blend the strawberries and measure the result. 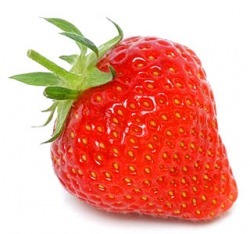 Measure out Xylitol to the equivalent of 1/2 of the mashed quantity of Strawberries ie: if you have 1 cup of mashed strawberries you would use 1/2 cup of Xylitol. Use the juice from one lemon per 2 cups of mashed strawberries. Bring to a boil with enough heat to keep it at a rolling boil when stirred. Boil for about 10 minutes, or until it looks glossy/syrupy. Stir now and then to prevent any burning, also watch out for splatter, very hot and will stain. Put a plate in the freezer as you begin hulling the strawberries. After boiling for 10 minutes dollop about a teaspoon of the jam on the plate and return to the freezer for about a minute. fter a minute run your finger through the dollop of jam and if the 2 sides stay separated the jam is ready. A dollop on Chocolate Icecream Sundae. Butter and Jam on Pancakes. Cheese, yes cheese! cheese and Jam is delicious. My low carb Cheesecake, spread it directly on the base after baking before adding the fudge layer!! Or make the fudge without the cocoa and make it vanilla, and do the above idea, wow!! I have used this jam recipe to flavour my icecream with stunning results!!! NB: all the above ideas should always be the low carb versions. NB: Xylitol in high concentrations compared to other ingredients likes to recrystalise, if you do find this Jam starts to crystalise just heat the amount of jam you want in a microwave for a few seconds.